I wanted to like this book because I think I would like this family. Sadly, I’m judging the book based on its content, not how appealing I find the authors. The cover promises that this is “The Harding family’s method for college ready by age twelve.” That’s what they’re famous for: of their ten children, those who have turned twelve by now have all been enrolled in at least some kind of college class by then. But the book isn’t really a useful how-to. There are a couple of short chapters in the second half that address their methods, but it’s mostly common sense: lots of reading, daily writing of any kind followed by revising, lots of math exercises and computer math games, and then a lot self-directed research on subjects and fields that interest them (and by research, they often mean Google). And a ton of prep for the SAT. There really isn’t too much more than that. So what’s in this book? The first half is entirely stories about the family. They’re nice, but probably not what anybody’s paying for. I’ve read the books by the Duggar family, and they also tell stories about themselves, but their stories are just to support the larger purpose of sharing their ideas about life. For the Hardings, it’s the other way around. Many chapters are followed by pages written by the children, including the very young ones, that are often nonsense. The book ends with some random messages from the father to people who are not the reader. All this shows what this book really is: a vanity project. That’s not the worst thing in the world, but it hardly inspires confidence that this is worth the reader’s time. It’s also not very well written. Each chapter reads like it was written independently of the rest, with no guiding plan. Concepts repeat themselves endlessly–we’re treated to the definition of quincenera, for example, multiple times. There’s a couple of pages about 9/11 and moon landing conspiracy theories. There’s some material defending why she still breast feeds her three-year-old son. And there’s an entire chapter that’s about how racism is bad. That’s it–nothing to do with education or even her children’s stories, just a few pages telling us that racism is bad. Why didn’t an editor catch all the repetition and randomness? 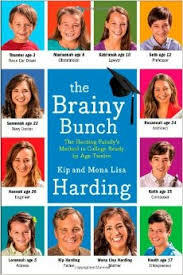 If you want to get know the Harding family, then sure, pick up The Brainy Bunch. Anybody looking for serious details about quality homeschooling would be better served by the standard on that subject, the supremely excellent classic The Well-Trained Mind.